Even in the skies, traffic jams happened. 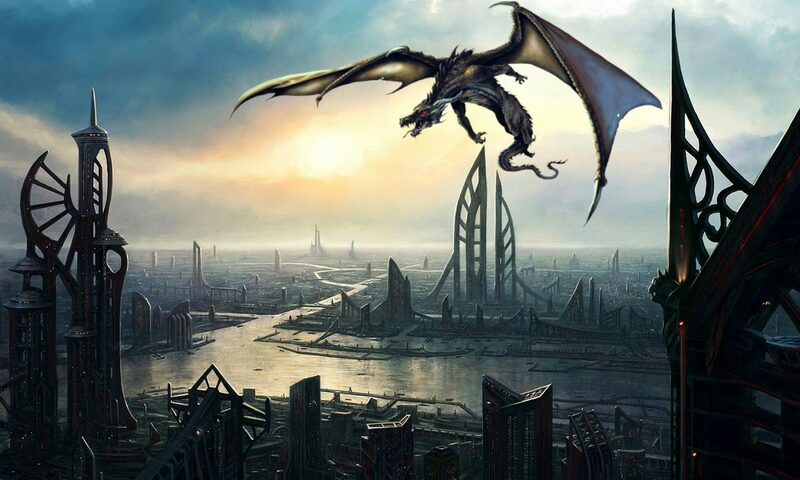 As Shroud flew over the district, clad in his armor of lightglass, he had to avoid other fliers, everything from monstrous harpy-like birds, insects, and even small spaceships. The alien sky above them shone with bright green stars and colored nebulae, but it was the towering crystal lamps on the ground that provided the most illumination. The golden streets and palaces of the Midnight Market laid beneath him, adorned by luxurious metallic buildings. All architectural styles mingled together, from Arabian palaces to strange, otherworldly crystal structures; domes seemed to be the most common structures. Many of the buildings moved on their own, equipped with brass limbs and other stranger means of transportation. The streets were crowded by alien and fantastic beings. A few Shroud recognized from mythology books, from ice giants to the more obscure centaur-like Nuckelavees; he had even glimpsed a snake-haired, blindfolded Medusa once. Other alien creatures, he didn’t recognize, such as bee-like humanoids, tentacle monsters, and strange entities made of ice and crystal. And although hobs were well-represented, Shroud had yet to see humans or even bullmen. None of the inhabitants paid him any attention. Instead, they bartered, exchanged wares, and did business. It seemed as though every street corner had a stand selling some kind of product, from liquid bottles to spaceship engines. Many of the walking buildings stopped at times to open to customers, sometimes even competing for specific spots. Merchants often fired at one another with lasers when they couldn’t agree, with the locals watching on with bored looks. Long ago, when he was in Universal Geography class, he had studied the Midnight Market in length. A gigantic space station spanning four hundred millions square meters, the Market was wholly artificial, although nobody remembered who built it in the first place. Its makers had shaped it like a rounded coin, with two faces each benefiting from artificial gravity. Shroud had yet to see the edge of the station yet. From what Mur told him, this part was the ‘Overside,’ the rich tourist area where merchants from all corners of the universe came to exchange their wares. The spaceport where the team had landed first, a gigantic flying black platform on which spaceships transited, floated a few miles away, bringing in goods from various galaxies. Besides the animated buildings, the Market lacked any grounded means of quick transportation like cars. Instead, Shroud often glimpsed frequent violet flashes from sorcerers of the Mapmakers organization teleporting people around the market for a fee. No one but the desperate, the dead, and the mad went to the other face of the coin, the ‘Underside.’ Mur said it catered to the most repulsive of the Market’s customers, the undead, beasts, and monsters which couldn’t behave on the politically correct areas without causing chaos. Both sides bowed to the same master, though. “More than you think,” Mur replied, grimly. That was the first time Shroud had seen the mercenary visibly cowed, which he took as a warning. The sorcerer glanced at the giant, multicolored Neurotower at the very center of the coin; a spiraling spire of black metal and vein-like, pulsating cables the size of skyscrapers. The structure dwarfed the tallest earthly mountains in size, with Shroud unable to see the tip reaching up into space. A thick, heavy aura surrounded the structure, the seven colors of magic spiraling upward like an ascending cloud. Mammon’s keep, and the compass around which the Market was organized. It was said the structure could be seen from the edge itself. Thankfully, no Gearsmen were to be found there. The Orange Ministry had an office there for trade, but the Market remained an independent galactic power. Shroud’s eyes darted to the sky, where a giant, mechanical moon looking down on them. An immense sphere of steel, with two fiery pits for eyes; when he looked hard enough, he noticed a thin line beneath them, like a closed mouth. Network didn’t give him any information when he glanced at the iron, ghoulish visage, so it wasn’t sentient. Perhaps the moon’s creator just had a morbid sense of aestheticism? Shroud got the feeling this alien world had a harsh learning curve. He had no idea how far he could fly up before escaping the artificial gravity, plummeting upwards to the machine moon. A part of him, the one that loved adrenaline rushes, urged him to try, which he suppressed. He had a mission to fulfill. “How long have we got?” Kari asked. With Booz busy organizing their meeting with the Shadow Queen, with the team in need of more spells, and Kari ready to level up, the Guild had decided to try one of the Quests available. Also, they needed Spellcoins to buy Babel. He had enough of relying on Mur to translate the local languages. It was like hearing people speak Chinese in front of you while you didn’t understand them, before laughing. You always left with the feeling you had been fucked over somehow. The Crimson King is an abomination against nature, a thief of souls, and a fan of theater. Too long has he threatened the souls of the living and the dead. Lure the Crimson King to the physical plane and destroy him utterly. He hadn’t understood the “souls of the living and the dead” part before flying over this district, seeing chained hobs sold by one of their own kind to an insectoid customer. Mur hadn’t lied. Everything and everyone was for sale. Those scenes filled him with revulsion, but against his better judgment he ignored them to fly over a large brass, roman-styled amphitheater, where the rest of his team had gathered; Maggie, Mur, and Kari in the stands, while Sol joined Shroud in flight. The other locals had deserted the area, leaving the place strangely silent compared to the background cacophony. They had a good reason to leave the place undisturbed. According to Mur, the Crimson King was an urban legend, a monster manifesting if a song echoed in the amphitheater when the Machine Moon moved right above it. The Crimson King and its court would appear, play theater, then haunt and kill whoever had seen them. The locals had wised up after a dozen disappearances, figuring out the rules, and left the Crimson King alone. “Begin the operation,” Shroud signaled through Network. Kari put the phone on the stairs, and let the music of Queen’s Don’t Stop Me now resonate in the amphitheater. The scene started subtly, gray shadows manifesting on the amphitheater stage. Souls of various species, mostly hobs, began to dance before their eyes, repeating texts in old Greek. The King’s previous victims, enslaved in death. A violet glow shone at the center of the amphitheater, like a rift in space-time. A strange figure crawled out of it, moving in ways that defied geometric logic; Shroud almost had an aneurysm at the scene. At long last, the rift closed, leaving the Crimson King standing at the center of the scene. A figure cloaked in bloodstained robes, his face hidden beneath a hood and a featureless silver mask, the King hovered above the ground without touching it like a ghost. After glancing with its unnatural visage at the Dragonslayers, the entity began to twist around his ghostly servants, like a conductor micromanaging its orchestra. This creature craved an audience. Shroud peeked at the creature with Network, trying to get an edge of some kind. Nothing but a vague feeling of wrongness. Like the fiery fiend Brown had summoned. Shroud hoped this one could bleed. “He has good taste,” Shroud replied, recognizing the play as Oedipus Rex through the actors’ texts. How an alien abomination knew of Sophocles was beyond his understanding, but he took it as a compliment to Earthly culture. However, the horrified, painful faces of the enslaved souls sent a shiver down his spine. He noticed ethereal, spinning spider strings pushing and pulling the souls like marionettes, forcing them to move for the King’s entertainment. The Crimson King stopped paying his audience any attention, wholly focused on the play. Would it only attack at the end? They wouldn’t let him take the initiative. “Engage,” he ordered. The fastest of them, Maggie drew her gun and shot the Crimson King in the face with a red bullet. The mask bled green. A thin line drew at the bottom of the monster’s face, revealing two rows of sharpened teeth twisted into a savage smile. The Crimson King let out a shrieking wail, freezing his enslaved souls in terror. Sol fell upon him like a falcon, sword raised, while Shroud unleashed a volley of lightshards from above. The King’s wail heightened in frequency, the Blue Sorcerer’s glass shards bending and then shattering before reaching him, the magical light surrounding them disrupted. The Blue Sorcerer felt his own glass armor start to bend from the pitching noise, flying farther above to stay away. Sol’s sword landed on the ground, as the Crimson King dodged the attack with a dancer’s grace, his movements unnatural. A silver rapier pierced through his robes, nearly impaling Sol through his visor; the knight deflecting the blow with his shield. As Maggie, Kari, and Mur leaped over the audience stairs to land on the stage and join the melee, the Crimson King muttered horrible, incomprehensible words in a guttural alien tongue. “Mur, what did he say?” Shroud asked through Network. A flash of violet light confirmed his worries, as a monster materialized next to Mur, shifting through a rift similar to the one that allowed the Crimson King into the physical world. An abominable fusion between a slug and an octopus the size of an elephant, with its dozen eyes bigger than cats, the entity howled through three organic trunks on its back. The monster turned to Maggie, attempting to grab her with its tentacles, a fate which the young woman avoided by back-flipping. Mur, whose tiny body had started growing metal plates thanks to Adamant, leaped toward the beast, trying to scratch it with his tiny fingers. Kari herself, clad in Oversoul’s bright aura, made a dash around the beast and joined the priest, trying to claw at the Crimson King. She went through a few dead souls, briefly making them flicker. The summoned being made no move to back up its summoner against Sol and Kari, focusing entirely on Maggie. Did the Crimson King control the creature? Did it even give a damn? The Crimson King kept both Sol and Kari pressured thanks to his swordsmanship, moving faster than both. His sword went around Sol’s shield, grazing his joints in search for a weak point to exploit; Shroud didn’t see any hand holding his blade if there even was one. In spite of her own immense agility, Kari fared worse, unable to land a hit while the King’s rapier pierced her shoulder, knee, and waist. While Kari ignored the pain, Oversoul’s power keeping her in the fight, she moved slower, her blows losing energy. Shroud observed the scene with a disapproving frown. She should have listened, he thought. Now far enough away he was relatively certain the King’s glass-shattering wail wouldn’t affect him, Shroud fired lasers from his lightshards. While he had previously needed charging time with Quasar, Lightbringer allowed him to manifest them at will. Although the Crimson King managed to dodge his beams with relative ease, it did give Kari the breathing room she needed to recover her breath and survive. Meanwhile, the other half of the team fared little better. “Squid is inedible!” Mur barked while biting at the tentacled monster’s chest, spitting out flesh. The imp used a Reinforce spell as his teeth turned to metal, piercing the piper’s flesh. “Mur’s strongest there is!” the imp snarled back. “Berserk!” Growing slightly bigger, Mur started climbing the piper’s trunk, Shroud cutting off one of the beast’s tentacle when it moved to grab the imp. The tentacle fell on the stairs, crushing Kari’s cellphone and interrupting the music. Seeing, or rather, hearing this, the Crimson King let out a shrieking howl, a sound wholly unlike anything from Earth. A terrible noise that made even Sol recoil. After its retort the King’s song heightened, becoming loud enough that Shroud began to feel physical pain in his ears, the monstrous playwright twisted around Sol, whose sword only pierced the monster’s clothes. No flesh beneath the robes. The truth suddenly dawned on Shroud. The clothes were the body. “Sol, Kari, the mask!” Shroud shouted over the song. “Hit the mask!” None of them seemed to hear him, and he himself couldn’t understand whatever Maggie was barking through her own feed as the summoned monster began to catch up to her. Argh, the song scrambled their words. Since he needed to vocalize words for Network to transform them into telepathic messages to his allies and the song turned them into gibberish, it prevented coordination! He can control sounds and frequencies, Shroud realized. Including one that disrupted his shards. Since he needed them to relay Lightbringer, this diminished his arsenal greatly. The fact he couldn’t coordinate his team also enraged him. Shroud had made peace with the fact he worked best in a team match as a long-range tactician and mastermind, and the Crimson King taking it away made him feel useless. Mur, who had climbed to the tip of the piper’s trunk and now more metal than flesh, fell into it. The tentacled monster instantly stopped pursuing Maggie, instead, letting out a loud howl even higher pitched than the Crimson King’s. Before he could react, Shroud learned a new meaning of pain, as his ears exploded and the world fell silent. Maggie fell on the brass stairs, holding her ears, while Sol and Kari visibly winced in pain. Heal! Shroud spoke, although he didn’t hear himself, the pain in his ear lessening for a second. Firing beams of light at the summoned monster and the Crimson King both, he focused specifically on the abomination’s mask. While the Crimson King managed to dodge by twisting its body in unnatural ways, the light seared the flesh of his minion, slowing it down enough for Maggie to regain her footing and escape it. In fact, the Piper had started to thrash around, scratching at itself with its tentacles. It suddenly occurred to Shroud that Mur was eating his way inside out. Meanwhile, it seemed Kari understood what Shroud attempted to do, lunging at the Crimson King’s mask with her claws extended. The monster moved to dodge, only for the Yellow Sorceress to rotate on herself and swing her right hand at an odd, unpredictable angle. The Crimson King, taken aback, couldn’t react fast enough as Yoshikage’s claws pierced his mask, covering her with green blood. Then, piercing the shrieking king with her other hands, she widened her arms, tearing the face into two halves. As Shroud guessed, the mask and the clothes were one, convulsing while Kari kept ripping the King apart; what they had mistaken for a rapier turned out to be some kind of limb. The green blood began to dry up, the Crimson King’s body falling into dust with a final death wail. With its summoner’s demise, the tentacled monster suddenly vanished in a flash of bright violet light, leaving a metalized Mur to fall with brain pieces in his fangs. The captive souls dimmed out, leaving black gems at the spot where they used to play. A good two dozen of them. “That was easy,” Kari said, bleeding profusely while Sol sheathing his sword, casting a Heal spell on himself. “I hope that was sarcasm,” Shroud replied as he landed next to her. She had a point though. The previous Dot Two group Quest had taken everything they had, while this one went relatively well. He guessed that between the entire group gaining access to sorcery and better coordination, they were ready for bigger challenges. With one exception. “You could have died there,” Shroud told Kari, as he cast the Heal spell on her, her wounds closing. He didn’t like behaving like a father scolding a child, but he had worried something similar may happen. “So you are okay to rely on me to provide you with cover fire and Sol to back you up, but a borrowed spell is off-limits?” Kari’s frown deepened, and Shroud suppressed the urge to pick her brain with Network, find whatever trauma caused her to behave this way. “I will purchase it,” Kari insisted, her stoic image replaced with childish sulking. Kari missed the obvious jab or didn’t care, gathering the various black gems. “The loot?” Kari replied, confused. “You are implying we should sell dead souls for money?” Sol asked, disgusted. While he had never liked Mur in the first place, he had grown to despise him since discovering the imp’s true shape. Shroud was more surprised that there was a market for dead souls in the first place. That implied Faustian bargains and other horrors. “You cannot be serious,” Sol said, while the suggestion clearly disgusted Kari. Shroud remained afar from the debate, looking at his team dividing into two sides. While Mur had lacked scruples since day one, Maggie’s casual amorality meant he was no longer outnumbered in team debates. This could prove a problem since Sol usually advocated the higher road and Kari backed him up. Using moral arguments or taking sides wouldn’t only widen a rift. Shroud needed to defuse the situation in a neutral way. “I am destroying the stones,” Kari said with a nod, her tone firm. After gathering all the soul gems, Kari crushed them within her hand with Oversoul’s blinding aura. Shroud expected a magical display as the souls escaped their prison. Instead, he simply heard moaning whispers and hushed words in alien languages, as the soul gems turned to dust. Magik Online’s victory sound and a status screen told him they had made the right choice. Each Guild member received 10 Spellcoins + 1 Bonus Spellcoin for releasing the captive souls. Mystery Gift (Death) for Yoshikage. A mystical feather once used by Egyptian gods to judge the sins of the dead. When used while uttering someone’s full, true name in their presence, the target is judged; an impure heart will be dragged to the Underworld of Duat. The Feather will become dust after one use. The picture of a white ibis feather laid next to the text. “Did everyone see that?” Shroud asked. “How is it that Matsumoto got that feather?” Maggie asked, confirming his thoughts. “We will see once we figure out how the reward system fully works,” Shroud replied, brushing the subject away, and looking at his compendium, purchasing Babel at once. “Come to think of it, it might be better that we each purchase the translation spell,” he said. “Mur doesn’t need translation,” Mur replied. “I will invest in Reinforce for my equipment, and save up the rest of my Spellcoins,” Sol said. “Growth hormones?” Maggie replied, the imp missing the joke. Shroud himself considered the pros and cons of both Needless and Peak, before deciding against it. While he needed to purchase Babel to function in the Midnight Market, he preferred to hoard Spellcoins until he had fully examined his Dot Two Compendium. His team had also missed a piece of very important information, whose implications didn’t escape him. Namely, that Egyptian gods existed. A/N: thanks to my amazing patrons on Patreon, Warwick Robertson, Johnathan, Marc Claude Louis Durand, Rhodri Thornber, Drekin, Bald Guy Dennis, Floodtalon, Dax, Karolus, Daniel Zogbi. As always, votes for Magik Online on TopWebFiction are appreciated. You can vote for Volume II by clicking on that link: http://topwebfiction.com/vote.php?for=magik-online.